Ok first of all, I want to clear something up about backstage beauty. Obviously, I am not suggesting you run to the bathroom and apply a bright-blue exaggerated cat eye. The reason I cover backstage beauty is so that we are all up on the trends, which ALWAYS trickle down into everyone's everyday life. Have you seen the Devil Wear's Prada? Do you remember the cerulean sweater? Watch THIS CLIP and you will see why following the trends as Fashion Week is actually important... for everyone! Ok, I am glad to have gotten that off my back. 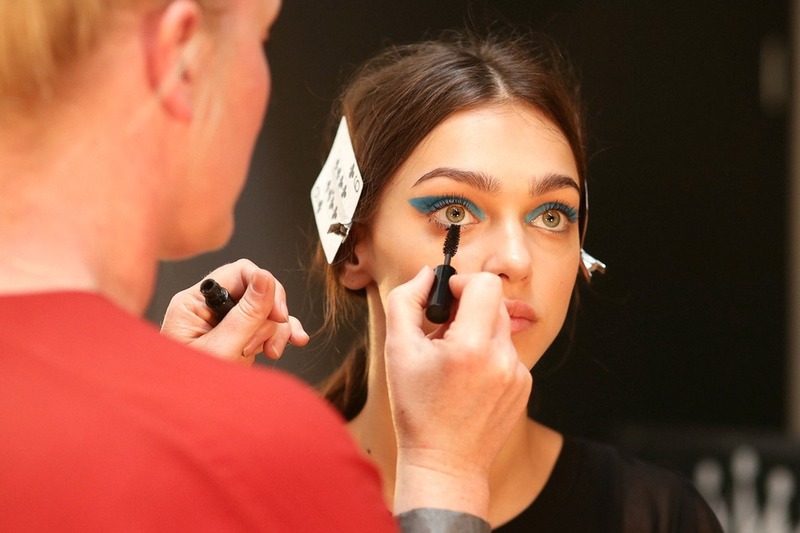 As I was saying, I was already sold that the 90s beauty fave, "blue" was back when we saw it last season at Kenzo, Giles, Prada, Christian Dior and so on. Well, it has begun trickling and I saw it again, backstage at Honor. 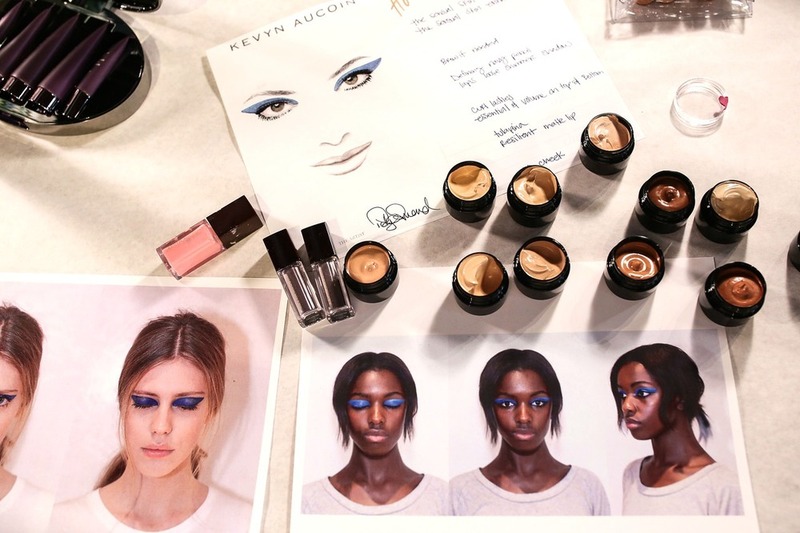 Makeup artist Polly Osmond told us the inspiration was “Transformation,” as she used Kevyn Aucoin Cosmetics for Beauty.com to create the look. Specifically, the transformation of a fictional debutante in the 1960s who meets a "George Harrison"character in the Bowery and is shown how to live. “She starts experimenting with makeup, being a little naughty,” says the makeup artist. As for the rest of the face, “the skin is natural because she hasn’t really got time to do it,” says Osmond — a trend that I saw backstage at almost every single show and we talk about SO much more. Simply put, skin is in. Anyway, back at Honor the lips were my absolute favorite part of the look. They gave me my own Kevyn Aucoin The Lip Gloss in Tulapina at the show and I have been wearing it Every. Single. Day. I've never had a Kevyn Aucoin gloss before, but I must say it was love at first use. It is the perfect simple, pink gloss (pictured above) and it was stunning on every single skin tone. The nails were wild. Kinda like crazy "3D psychedelic polka dots" but I did get to chat with super manicurist Nonie Crème, the former founding creative director of Butter London, about what she feels is the trend here. Nonie feels like nails are about to become super high contrast. For instance, if you were to Google a color wheel and look at orange (a color seen throughout Honor's collection) and then go to the exact opposite side of the wheel, you would find the cobalt blue she used. "So it's contrast opposed to clash" she said. As far as shape, Nonie said we are done with pointy, but she still really hates square. So "anything that isn't super pointy and isn't square goes!"